As I have mentioned in a few posts, I have had the privilege of working with some teachers at another elementary school in the past month through the work of the Western Massachusetts Writing Project, and I spent one whole day there recently, modeling some activities and exploring some ideas with the staff. At the end of the day, I sat down with the principal (Mike), the technology teacher (Liz), the literacy coach (Stephanie) and a lower elementary classroom teacher (Lauren) to talk technology for the school’s podcast feature on its website. It was one of those great ideas for wrapping up the day, and we had a wonderful conversation that touched on a lot of different areas that relate to technology and learning. The school just posted the podcasts (the hour was wisely divided up into three shorter sections) and I asked the principal if I could grab a copy, and share the conversations out for others. He willingly agreed, and encouraged me to do so. So I am going to be sharing out the three parts of the podcast over the next few days. The first part of the podcast revolves around student learning and engagement, and I sought to define digital storytelling a bit (since that was a focus of the day). We also chatted about how to use technology as a school to reach out to parents and the community. The other classroom teacher, Lauren, has her young students now using Twitter to broadcast to family what is going on during the day (no more: “nothing” to the question of “what did you do today?”) We also touched on the idea of moving technology right into the classroom, and not having it seen as a separate unit of instruction. I hope you enjoy the podcasts – the second part will get published tomorrow, followed by the third piece on Wednesday. Even though I was there, and talking, it was only when I went back and really listened did I realize just how much ground we had covered in our conversation. Yesterday, I wrote a bit about how the new TED-Ed site was experimenting with ways to remix, flip and otherwise redo their own lessons and video content, and since I am curious about new tools, I dove in and gave it a try. The tool is set up around a video, but you have quiz questions that are set up (with video helpers if you get stuck), some open-ended discussion questions (or you can make your own, as I did), a space for additional links and resources, and a final thought. I found it incredible easy to use, and it seems simple to adapt for my own needs. Actually, the lesson I ended up creating is the second variation of a lesson I created around Shakespeare and insults — the first one had a word (ironically) that I wasn’t comfortable with in one of the quizzes, and you can’t edit a flipped lesson once you publish it to the site. So, I redid the whole thing. I still don’t think I will do THIS lesson with my sixth graders (we do a variation of the Shakespearean insult, though). But, I have some seeds of thinking going on now. I’d like to invite you to give it a try. I’m still not sure if this is something I can use with my students (as I am still not sure of the whole flipped idea), but I am open to exploring it more and figuring that out. Certainly, the remix tool is easy to use, and looks great when you are done. And, I think you can even pull in YouTube videos and more as content to your lesson. It’s a great way to curate information in a TED package, and if viewers are logged in, you can track their stats as they move through your lesson. (The need to log in is what would stop me with my students, since they do not have their own email accounts). This is another in a series of projects done around independent reading. You know, Mike Lupica has done more to get my sporty boys reading than any other authors (except maybe Rick Riordan), and I was happy to see this student immersed in this novel about a sport he loves to play. The book is The Underdogs. This is pretty cool, and I am trying to figure out how I can use all of the features of the new TED-ed site with my students. I’m still not certain of the whole “flipped classroom” model, but perhaps this kind of site (that allows you to not only access amazing videos but also curate your own) might be a way to experiment a bit with the idea. 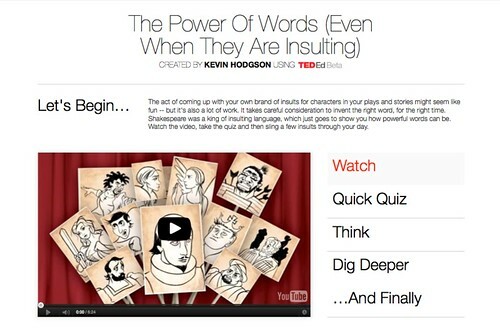 The new TED-ed Site is worth checking out. 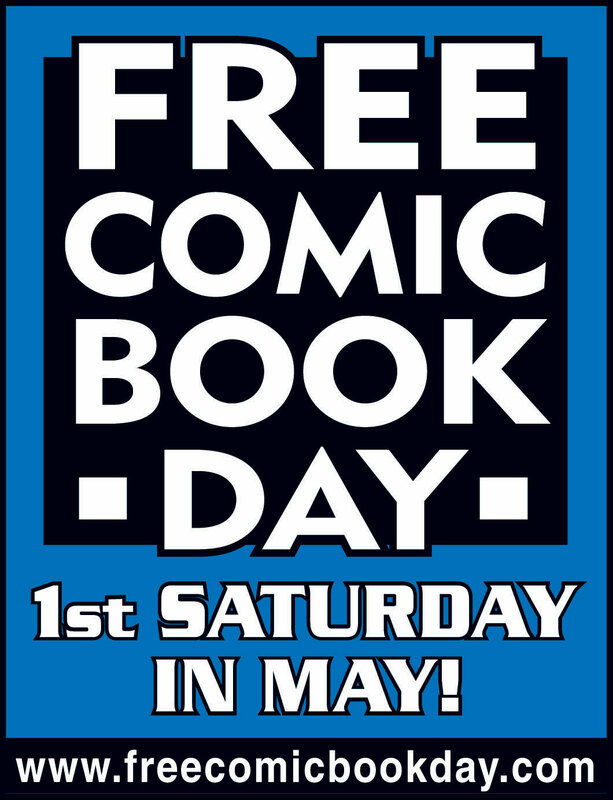 Tomorrow (Saturday) is Free Comic Book Day. Go down to your nearest comic book store (do you have one?) and grab a few free comics. They’re not always the very best comics, to be honest, and you may need to make sure they are appropriate for whatever age kids you are going to share them with, but … did I mention free comics? The website for Free Comic Day (now 10 years old, apparently) has more information, including a handy tool to find comic book stores where you live. I usually go with my sons, and we all get handfuls of comics. I bring mine into my classroom for my students. They love it. I have long been fascinated by the genre of Choose Your Own Adventure books (and how to flip that interest that kids have in those stories by having them plan and write them). I’ve used wikis to have my students create their own, and will probably do that again before the end of the school year, and I have presented the concept of merging technology and writing with those kind of stories that branch out in different directions. The other day, I came across a website that just blew my mind. It is a comprehensive look at how Choose Your Adventure stories unfold, and the researcher (whose name I can’t find) took a real analytical approach to what it means to read one of these books. They examined the books across the years, using colors to chart the various endings and choices. Using all sorts of data analysis and graphs, the writer really unpacks the critical thinking that goes into being an active reader. It’s fascinating. On the flip side, having students plan and write these kinds of stories is an interesting endeavor. At least with my sixth graders, some “get it” and some don’t – mainly because of critical thinking skills. Those who get it compose rich stories with multiple exploration points, and some narrative branches will even arc back with others. Those who don’t get it still follow a very linear path — and who can blame them if that is all that they ever read. The use of the powerful “hyperlink” opens up possibilities for this kind of writing, though, whether it be via a wiki or powerpoint or even a folder of Word documents. (or even using Google Docs forms to do the same thing, which is another interesting twist). And, if you want to stretch it even further, you can now annotate videos on Youtube, and create visual Choose Your Adventure stories. I did this experiment a few months ago when I was writing about mentor texts. Watch the video and click in the video to make your choices. Notice how the viewer is the one with a bit more agency than usual, just as the reader is with the books. Come join the adventure with The Mysterious Fruit story. I have to admit: when a student came into our independent reading unit with this book by David Sedaris (ironically, the ONLY book by Sedaris that I have not read), I was more than a little surprised. A sixth grader … reading Sedaris? But I only reserve my “no way” for books that really don’t belong in the hands of an 11 year old, so if she was game — why not? What I like is that she was a pretty critical reader of the stories in the collection. See her digital poster on Squirrel Seeks Chipmunk. I was in my YouTube account the other day and noticed that there is now an option to move all old videos from the former Google Videos into YouTube. Nice! I thought I had lost a lot of those movies (I used to use Google Videos all the time). Here is the very first stopmotion movie I created, many years ago now, that uses an original song and an art figure that is trying to dance. It’s still fun to watch (for me anyway). I remember all the logistics of trying to get the camera right, and learning how to use the capture software and then MovieMaker. Luckily, a friend from the National Writing Project — Tonya Witherspoon — was a good mentor, and it was her enthusiasm that got me started. If you are interested in stopmotion moviemaking, I have a website resource that might be handy for you and your students.